Reader in a pickle. Can you help? Yes, C, that’s a major hit for those local farmers and farm workers who are losing out on the cuke contracts. Which, I’m figuring, is all the more reason to rush out and buy leeetle craft-jars of three baby pickles each at your neighborhood farmers market. Granted, they’re not the dills you’re after, but they’re ex-cell-ent, and really easy to make. I think you should just turn over a new leaf, so to speak, and grow your own cucumbers — the season is soon upon us — and then try this easy recipe for dills. But I feel your pain. I’m addicted to Claussen’s Kosher Dills . I always bear my husband’s wrath when I snack on their garlicky goodness. But their carbon footprint (and the fact that they’re owned by Kraft) isn’t what you’re after, I take it. So: anybody have an answer for “C”? Local cukes. 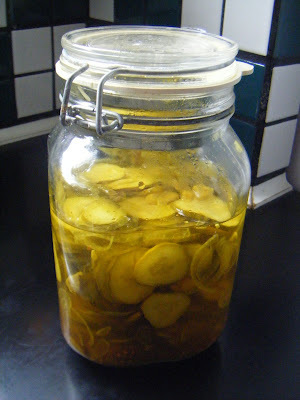 Pickled with dill. Not too sweet. Not too precious.